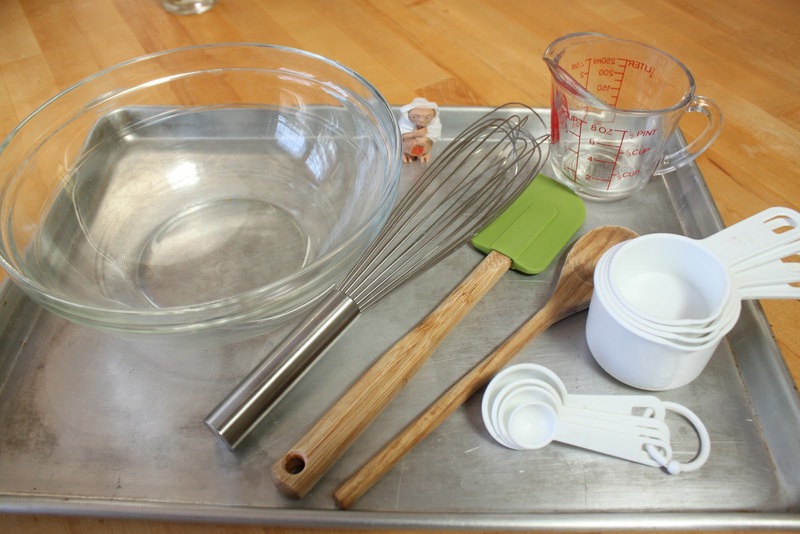 You need just a few pieces of baking gear in order to bake cookies successfully. Simplicity is one of the advantages and joys of baking cookies. To get started, you need just a bowl, a large spoon, a set of measuring cups and spoons, a standard 13 x 9 baking pan, and a metal spatula. With these essentials you can make many kinds of bar cookies, drop cookies, no-bake cookies, molded cookies, rolled cookies, brownies, shortbread, and all kinds of easy cookie recipes. Some may require a bit of sweat equity without an electric mixer, but they are possible nonetheless. Just a few more pieces of baking gear make baking cookies even easier. You needn’t spend a lot of money for them, either. When it comes to best gear for baking, usability is the key. Mixing bowl. An essential item in any kitchen, mixing bowls are available in various sizes and in stainless steel, glass, ceramic, and plastic. Measuring cups and measuring spoons. Dry measures are available in sets of graduated, nested cups and spoons. A liquid measure is a clear, hard, plastic, or glass cup with a special lip used for pouring. Large spoon. Wooden or plastic – choose which works for you best. Many easy cookie recipes can be mixed by hand with a large spoon. Even if you mix together cookie dough with an electric mixer, you will use a large spoon to stir in additional ingredients like chocolate chips, dried fruit, and nuts. Whisk. Use a whisk - a conical nest of wires -to whip eggs before adding them to the cookie dough or to fluff flour and aerate it before measuring. Electric mixer. Both stand mixers and hand-held electric mixers have a motor which drive beaters in a circular motion to mix cookie dough. Stand mixers are built with a frame which holds the motor casing, beater mechanism, and a rotating bowl platform. Hand-held electric mixers have a handle attached to the motor casing and beater mechanism. Plastic scraper. This hand tool, also sometimes called a spatula, is ideal for scraping cookie dough from the sides of the mixing bowl when combining ingredients. Rolling pin. Made from wood, plastic, or marble, a rolling pin is a solid cylinder used to roll out cookie dough before forming it into shapes or cutting it with cookie cutters. Cookie cutters. Made from metal or plastic, these hand-held gadgets come in limitless shapes and sizes. Use cookie cutters to cut rolled cookie dough into individual units. Baking pans and baking sheets. Choose and use the bake ware indicated by your cookie recipe so you get best results. Baking pans have rolled or raised edges to contain cookies or other baked foods. They are available in a variety of shapes – square, round, and rectangular. Baking sheets, also called “cookie sheets,” are flat and rimless. Their large surface area, usually about 14 inches by18 inches, allows room to hold a large number of cookies with the customary 2 inches in between each one. Cooling rack. This rectangular wire grid has feet that sit on the counter top. You can set your baking pan or baking sheets on the cooling rack when you remove it from the oven. The cooling rack, or wire rack, allows air to circulate around the pan so it cools quickly and evenly. Turner. Also called a spatula, this hand tool is available in metal, plastic, and wood. It has a flat, elongated surface and squared edges that make it easy to slip underneath cookies to remove them from the baking sheet or from a baking pan. Airtight containers. Use plastic or metal containers that seal tightly, like Rubbermaid® containers or even cookie tins, to store your homemade cookies. A tight seal keeps cookies from drying out and getting stale.